I may as well get this out of the way: Driver: San Francisco has one of the dumbest premises in all of gaming. In an industry that brought us barrel-chucking apes, speedy hedgehogs, and the concept of double jumping, that’s quite an accomplishment. Once I stopped snickering over the idea of playing as incapacitated cop John Tanner, inexplicably blessed with the power of astral projection, I was completely hooked. Apparently, all it took was a coma to revitalize the Driver series. Tanner is imbued with this power after getting in a wreck with his nemesis, Jericho. As he lies in stasis in a hospital bed, Tanner finds that he’s able to leap out of his body and transfer his consciousness into anyone who’s driving in San Francisco. Armed with that superpower, Tanner has to track down Jericho and prevent him from carrying out a massive terrorist attack in the city. Tanner’s newfound abilities do more than add an odd bullet point to the back of the game’s box. The Shift mechanic fundamentally changes the very nature of the racing game, simultaneously satisfying my need for speed and lust for mayhem. I’ve chased down countless felons in racing games, ramming their bumpers and trying to steer them into walls. Shift changes things considerably. Thwarting the bad guys can be as simple as popping out of Tanner and scanning the nearby traffic. As time slows, you select an appropriate vehicle (a fuel tanker heading the opposite direction is always a good choice) and take control of it, slamming into the target vehicle head on. Losing a race? See how the leader reacts when you assemble a roadblock out of buses. Or go on the offensive and pick your opponents off one by one, winning by default. When you Shift, the game’s AI takes over driving duties in any car you leave behind, so you don’t coast to a stop or worse. Shift is optional for the most part, so you can choose to beat missions fair and square if you like. Crashes are a fundamental part of the game, which makes their lackluster presentation all the more disappointing. Time slows, the camera zooms in, and glass shatters, but few of the impacts feel as though they carry any weight. Fuel trucks impotently stall out and crumple the same way as compact cars, only on a larger scale. It’s a bummer, and the payoff typically fizzles out instead of exploding. Unraveling the game’s conspiracy is fortunately more complicated than simply replaying the same cops and robbers scenario over and over again and winning a few street races. In some missions, Tanner has to assume the identity of low-level criminals and see how they fit into the larger puzzle. That might mean tailing someone, or impressing a contact with slick driving. 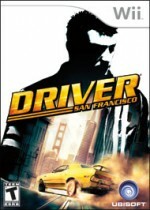 I was pleasantly surprised by the amount of variety that Driver: San Francisco delivered. In the span of just a few missions I gave a reality show some prime crash footage, helped protect an armored car from hired goons, and got a discount on driver’s ed by scaring the pants off the instructor. All of the major missions are introduced with picture-in-picture dialogues, which deftly set the scene and underscore the game’s generally lighthearted tone. In addition to the main missions, you can undertake dozens of dares, races, and other short tasks. I devoured these like popcorn, and found myself saying, “Only one more,” more often than I’d care to admit. Even after beating the game, I went back and started mopping up the various missions that I didn’t pass. The excellent controls make these stunts a breeze to pull off. Thanks to Shift, if you aren’t able to pull off the designated powerslide or get fast enough to catch the required amount of air, scanning the world for a more suitable ride is easy. When you’re in the mood for a more permanent set of wheels, you can spend the points that you earn on more than 100 different licensed vehicles, as well as various skill upgrades. While some people might be genuinely interested in the story’s criminal investigation, I was more engaged with Driver’s bizarre supernatural element. How does that angle of the story get resolved? Surely, there has to be a rational explanation for why Tanner can leapfrog from person to person, right? Or how he can bust a criminal network from his bed? Or how he’s able to effortlessly chuck cars around and freeze time? Without venturing into spoiler territory, Ubisoft Reflections does a nice job of wrapping it up. The game isn’t over after the credits roll; the multiplayer mode is fun to explore, with career progression and a variety of inventive match types. Tag was one of my favorites, transporting the playground staple to San Francisco’s rolling hills. Knowing that your opponents can take control of any car in the world creates an exhilarating sense of paranoia. Even the ordinary races are a blast, with paint getting traded at nearly every turn. If you’re the kind of player who gets in a snit because of random traffic, however, your patience will be tested. Driver: San Francisco is easily the most surprising game I’ve played this year. I’ve been a fan of arcade racing games for as long as they’ve been around, and Ubisoft Reflections shows that there’s still plenty of life in the genre – even if it means remotely controlling the action in a hospital gown somewhere. Apparently, all it took was a coma to revitalize the Driver series.